From the perspective of the Feng Shui, the human diseases are predestined from birth or they emerge from the spread of a harmful energy. However, any illness can be treated using methods that were invented in the ancient China. 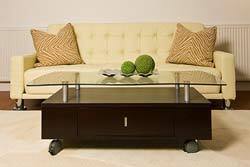 Let's start wi th one of the most important aspect - the location of objects in the house. According to the Feng Shui experts, items that are standing in the wrong places are able to seriously weaken the body, and vice versa, the correct alignment will make the recovery faster. Every single item, according to the ancient Chinese philosophers, has a certain vitality, especially if it is made by people, rather than on the factory line. There is nothing in the world, that is not alive. The energy of the objects should be used right, so that it has a maximum of positive impact on the residents of the house. For example, when choosing a house, you should be aware which side of the horizon will be your kitchen facing. At the kitchen, located to the west, everything will be slowed down by the energy of degradation. The digestion with residents of the house will be slow, their movements - sleepy. Kitchen, located on the southern side is very favorable for cooking and eating, but it will attract many visitors, who do not want to leave for a long time. Kitchen, situated in the north is open to the forces of evil. Here, as in the west, everything will be very slow and also will appear various disorders of the stomach. It is not good at all, if the kitchen is located next to the toilet. In this case the "Qi" energy will be constantly polluted. Even if we disregard the teachings of Feng Shui, there is not much pleasure in such a location. Especially bad impact has the location of the stove near the wall of the toilet. You practically cook in the toilet in this case! Help in such situations can come from the tiles in the bathroom (the element of Earth), and in the kitchen you need to put various ceramics beside the "negative" wall. A stove is still worth to be moved! It is also undesirable to have a stove on the other side of the bedroom wall, especially if there is a bed standing. This will lead to the diseases of the Fire element (ex. : heart problems). In this case, the division also is possible by the ceramics. Stove, located in the corner, also severely affects the health of people in the house. Food, that is cooked on a stove, in this case will not benefit. In general, the kitchen should be painted in the light halftones, but at the same time look bright enough. It is highly undesirable to have a large pictures on the wallpaper, or images of knives, forks and other sharp objects. Remember, each point or line can affect your health. The system of Feng Shui condemns the rectangular tables. It is not recommend to sit on the corner, since the angle guides to the human diseases or weaknesses. Rectangular table can be secured by using the individual napkins of a round form. If the bedroom is opposite to the front door, do not be surprised when the guests, who just came into the house, will immediately feel tired and sluggish.